Backing up your data to a network, whether a shared network or an online network, is a valuable way of storing your data externally to your computer. It is relatively simple to do and you are limited only by the storage capacity of the target network. If you wish to set up a home-based network, to which your home PCs can connect and to which you can back up your data, you will need to invest in a router and a server. 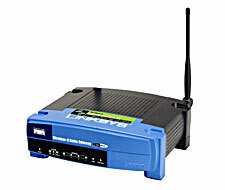 The router buffers and forwards data packets between computers, whilst the server (which may be one of your home PCs or a hard drive designated for this purpose) provides file services to the computers connected to it. Most of the leading software manufacturers market some types of routers, and your decision as to which is the most appropriate will most likely be based on the number of computers you wish to connect, the speed you wish your network to operate at and the amount of money you wish to spend. In deciding what sort of server you wish to purchase, you need to consider network speed and necessary storage capacity, as well as the purchase cost. Some network drives have not one, but two drives. This is helpful in one of two ways: first, you can combine the drives and get extra storage space or second, you can create a mirror of your data on the second drive, giving that extra layer of data backup protection. If you do not wish to invest in the hardware to establish your own home network, or if you do not have network access at work, you may wish to consider backing up your data to an online network. Using the storage space on the commercial provider’s server, you can create backups of your data in a remote location. You will not need any additional hardware to take advantage of this option. f the bundled software. First, if you are running one or more Macintosh computers on your network, you will need to ensure that the software on the network drive you purchase is compatible with your Apple. Secondly, some software products allow you to view your backed up data remotely, using the internet. This can be handy, especially if you travel frequently. If you plan to back up to a remote server, you will need to set up the software particular to the commercial provider to whose services you are subscribing. The cost of this software should be included in the subscription fee that you are paying. Setting up a home-based network is not for the computer-challenged. If your idea of a server is someone bringing you food, then you probably should not attempt to set up your own network. IT companies can come and do this for you, and can help you establish your backup schedule. Another good solution is to take the option of subscribing to a remote hosting service. If you are more IT savvy, you will probably be able to follow the manufacturer’s instructions associated with your router and server and will be able to set up your own network. From here, you can use the Backup Wizard of your operating system to automate backups to the network drive. Maintaining a network can be a constant challenge, however having your data backed up to a network drive and, possibly, mirrored on a second drive is a fairly reliable method of data backup. The problem is that your data is all stored in the one physical location, which can be a problem in the event of a fire or other natural disaster. In this respect, storing your files on a secure remote server is a good idea. A second advantage of storing data on the server of a reputable commercial provider is that they will offer you a service guarantee. Since the provider is highly accountable, it is likely that their own backup strategies will be very robust and your chances of losing data are minimized. Backing up your data to either a local or remote network is a good idea if you have a large volume of data. Using the software associated with your network drive, or that associated with your operating system, you can easily automate the backup process. Next How do I add USB ports to my computer?